Growing up we had traditions for everything. We had traditions coming out our ears. One of them was our "Children for Children Concert." Around Christmas-time, my parents would invite all our neighbors over for a concert performed by children (their children...and us), and the admission price was whatever each family wanted to anonymously stick in an envelope at the door. Each year the donations went to different causes. 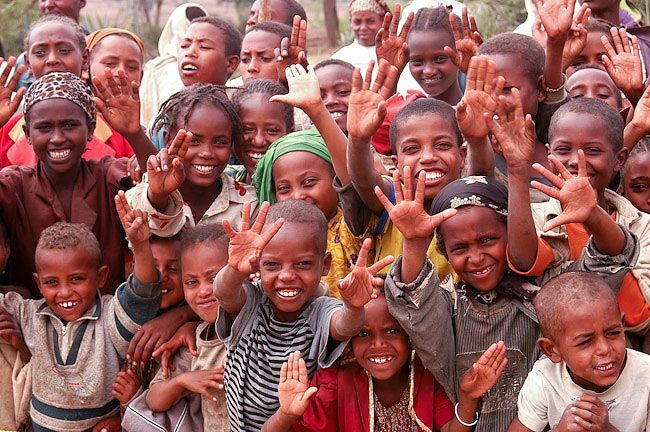 I don't remember all of them, but I do specifically remember one that was aimed to help kids in Africa. My heart caught fire on that one. I pictured all those kids over there needing my help and pledged a bunch of my hard-earned money right along with the other parents. I think that's one of the reasons I finally got to go to Africa a few years ago...I had sent my heart over there many years before and had to go retrieve it. 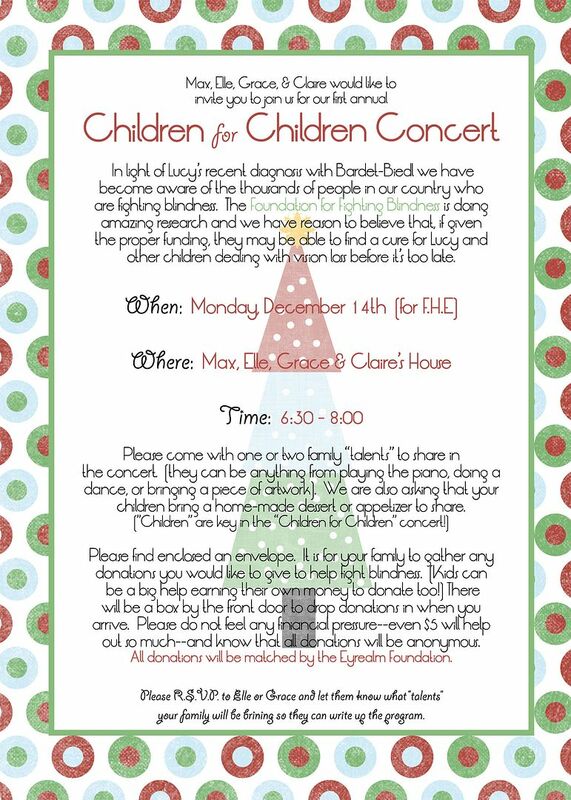 Well, every year since my kids have been old enough to understand this type of thing I've felt compelled to throw our own "Children for Children" concert at Christmas-time. I want so much for them to feel the meaning of giving more powerfully. But I have always pushed my urge to the back-burner. I gave myself an out. My brain was strained to the max into the wee hours of the morning editing endless photoshoots. There was no room for extra service, for crying out loud! But this year the door was ajar. Sure, other things have piled in to overflowing where the absence of photography left any holes, but seriously, I needed to get a grip. Plus, well, my kids were all over the idea like bees on honey. With all this "I Love Lucy Project" stuff floating around our house all I had to do was mention the idea of a concert to raise money for blindness and they were there, hook, line and sinker. So, we had our concert. And man oh man am I ever happy it's over with! I kid. It was a lot of work, but it was sure worth it. I think the biggest "work" for me was to really let my kids take the reins. I mean, it is a "children" for "children" concert, after all...no parents being all bossy in that title. And man, I have a hard time letting go and not taking control. But "let go" I did, and I have to say that these kids did an awesome job. They delivered every invitation to the neighbors on their bikes (except the two that got lost under a stack of mail on my desk). They made calls to ask people to bring extra chairs. They tracked down a microphone for us to use (which ended up not working but at least they tried). They made up the treats to give out as people left and helped with the refreshments. But most importantly, they were the MCs. And I kept my mouth shut almost the whole time. Don't get me wrong, this whole little deal sure as heck didn't go off without a hitch. My kids all looked like ragamuffins, the house is STILL not done with my little re-sprucing project, I was in a bad mood all day in preparation because everything was caving in on me and everyone seemed to need something or other at the same time. Dave had to remind me we were actually doing this for Lucy, who I was mad at for throwing multiple fits at the last minute. BUT, still, it was all SO worth it to see those kids up there conducting things and beaming their cute smiles. 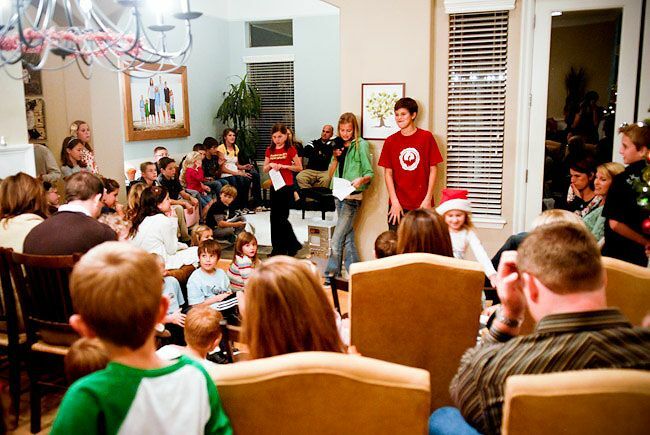 This house was jam-packed with the best talent-sharing kids around. My brother set up this video for people to watch while they were enjoying the refreshments, and the donation box filled up with almost $600 to help fight blindness. 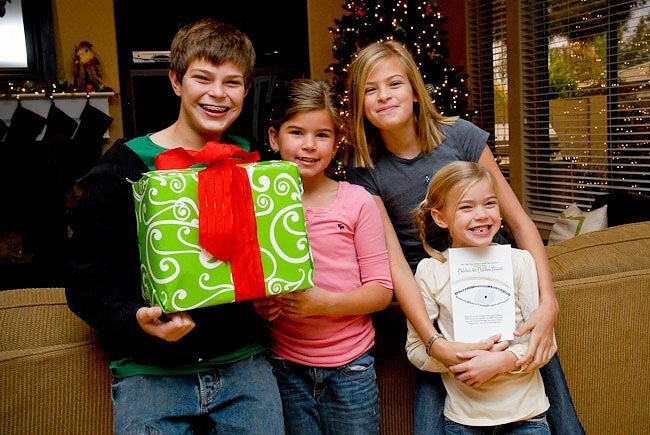 The great thing about that is that the Eyrealm Foundation will match all those donations, so together this group of wonderful neighbor kids collected $1,200 to help find cures for blindness. And THEN I found this link last night and realized that if we get the donation in by the 31st (which, of course, we will) it will double AGAIN to make a grand total of $2,400 to fight blindness. Now that's not too shabby! If anyone else wants to get their donations doubled by the Eyrealm Foundation, then doubled again by these generous people in the video above, just send donations into the address on this post. Thank you SO much to everyone who came. We adore you. 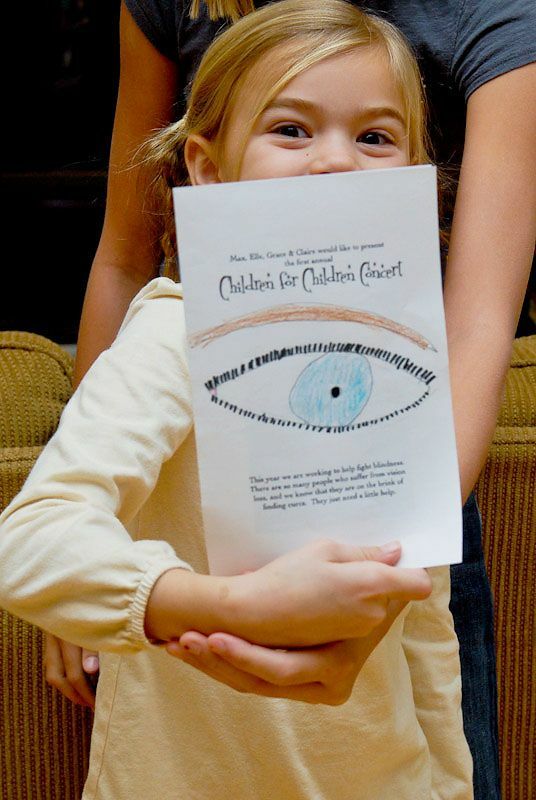 And Lucy, along with the estimated 100,000 other people in the U.S. dealing with retinitis pigmentosa join us in thanking you for these donations that will help them so much! Looks like you had a great turn out! I am sad we couldn't make it! Wow, Shawni. That is so cool! What a great idea! i'm so glad we got to be a part of it. it was a great opportunity for our kids not only to donate, but to get up in front of a bunch of people and perform. thanks so much for the opportunity! Wow, such as great idea Shawni! I so admire you!!! Thank you for being such an inspiration! I shared some of the details of the "I Love Lucy" project with my colleagues here at work and they were so touched and I'm sure many of them will contribute! All the very best to you and your wonderful family! That is such a neat opportunity for the kids. Your family is amazing. I've been following you guys ever since I read your book back in May. Your family is an inspiration to me, a mother of three kids under the age of four, who's trying to survive the trenches and tackle Joy School. Thank you for your good example and wonderful posts. They keep me motivated. That's pretty darn incredible! What an amazing gift to pass on to your kids. hooooray!! that is so exciting that you did so well! in other news, claire lost that tooth on the bottom!!! Thank you for including us in a night to remember! I loved the fact that my kids wanted to donate their own money. We all love that sweet Lucy! SO sorry we couldn't make it - what a wonderful opportunity for your kids. I had no idea you guys went to Africa! We will have to talk. Could there be a more amazing family out there? Great idea! And thanks for including the hectic moments. It seems like every time I try to organize a "good idea" I'm always regretting it in the moment. I wonder, did I plan wrong? Do I have the wrong attitude? Why am I even doing this? Good to know I'm not alone. And, of course, in the end I would do it all again in a heart beat. Thanks for your good example. Ah Shawni! This is so great... what a way to teach your children service: on so many levels! Wow! That is AWESOME. What a great idea. We are having our cousins concert here tomorrow night. I think I need to copy your idea and open it up to the neighborhood for a good cause next year. You always inspire!! I'm assuming my invitation got lost in the mail...:) But what a great idea! For future reference, we have a good microphone and sound system you can use. Retinitis pigmentosa is generally inherited from a person's parents. There is no cure for retinitis pigmentosa. Effective therapy and retinitis pigmentosa treatment may reduce the problems.